How much more ridiculous can the US Postal Service get? This you will not believe. It has embarked on a public relations campaign to get people to stop sending so much email and start licking more stamps. This is how it is dealing with its $10 billion loss last year. Meanwhile, rather than offering better service, it is cutting back ever more, which can only guarantee that the mails will get worse than they already are. It’s true that mail still has a place in the digital world, as the post office says. But the government shouldn’t be the institution to run it. It already has competitors in package delivery but the government stands firmly against letting any private company deliver something like first class mail. And so it has been since the beginning. The state and only the state is permitted to charge people for non-urgent paper mail in a letter envelop. It’s a control thing. The government is into that. And it is far from new. 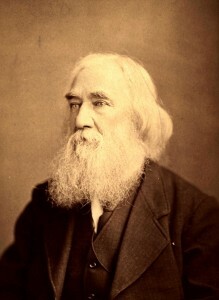 Do you know the amazing story of Lysander Spooner? He lived from 1808 to 1887. His first great battle was taking on the post office monopoly. In the 1840s, he was like most people at the time: fed up with the high prices and bad service. But as an intellectual and entrepreneur, he decided to do something about it. He started the American Letter Mail Company, and his letter business gave the government some serious competition. It opened offices in major cities, organized a network of steamships and railroads, and hired people to get the mail to where it needed to be. His service was both faster and cheaper than the government’s own. Then he published a pamphlet to fight the power: “The Unconstitutionality of the Laws of Congress Prohibiting Private Mails.” It was brilliant. It rallied people to his side. And he made a profit. The government hated him and his company and began to litigate against him. It dramatically lowered the price for its services, and used public money to cover its losses. The goal was to bankrupt Spooner, and it eventually succeeded. Spooner’s private postal system had to be shut down. It’s the same way the government today shuts down private schools, private currencies, private security, private roads, private companies that ignore the central plan, and anyone else who stands up for freedom. From this one anecdote alone, you can see that the post office is hardly a “natural monopoly” — something the government has to provide because free enterprise can’t do so. It is a forced monopoly, one kept alive solely through laws and subsidies. If the post office closed its doors today, there would be 1000 companies rushing in to fill the gap. Just as in the 1840s, the results would be cheaper, better services. The government runs the post office because it wants to control the command posts of society, including communication. The Internet as a global communication device snuck up on the state before the state could kill it. Let’s return to the 19th century. Spooner didn’t go away. He was more than an entrepreneur. He was a brilliant and pioneering intellectual, as the collection The Lysander Spooner Reader makes clear. He was a champion of individual liberty and a passionate opponent of all forms of tyranny. He was an abolitionist before it became fashionable but he also defended the South’s right to secede. Most incredibly, he was probably the first 19th century American to return to the old anti-Federalist tradition of post-Revolutionary America. He did this by asking the unaskable question: why should the US Constitution — however it is interpreted — be binding on every individual living in this geographic region? This document was passed generations ago. Maybe you could say that the signers were bound by it, but what about those who opposed it at the time, and what about future generations? Why are the living being forced to live by parchment arrangement made by people long dead? Why are the living bound by a privileged group’s interpretations of its meaning? In his view, people have rights or they do not have rights. If they have rights, no ancient scroll restricting those rights should have any power to take those rights away. Nor does it matter what a bunch of old guys in black robes say: rights are real things, not legal constructs to be added or reduced based on the results of courtroom deliberations. Plenty of Americans before his time would have agreed with him! It’s still the case. Now, keep in mind that Spooner lived in a time where the living memory of these debates had not entirely disappeared. He knew what many people today do not know, namely that the Articles of Confederation made for a freer confederation of states than the Constitution. The Constitution amounted to an increase in government power, despite all its language about restricting government power. Remember too that it was only a few years after the Constitution was rammed through that the feds were suddenly jailing people for the speech crime of criticizing the US president! Spooner spoke plainly: what you call the Constitution has no authority to take away my rights. Hence his famous essay: “Constitution of No Authority.” In “No Treason” he argues that the state has no rights over your freedom of speech. In “Vices Not Crimes,” he shows that people in any society are capable of doing terrible things but the law should only concern itself with aggression against person and property. Reading them all together, as they are in this book, is a radicalizing experience — a liberating experience. It makes you see the world in a completely different way. It’s true that they aren’t teaching about Spooner in public school. But he was a giant by any standard, the 19th century’s own Thomas Jefferson (but even better than Jefferson on most issues). There is still so much to learn here. It’s no wonder that his legacy has been suppressed. This edition of his best work is published by Fox & Wilkes, an imprint of Laissez-Faire Books. Incredibly, you are still permitted to buy this and read it without getting arrested — for now. I think that postal monopoly of today is out of the picture. Thanks for the introduction of the world wide web.